While I do have trouble keeping my hands off the kitchen tools, I also know well enough not to indulge in one-trick ponies. Sure, I’ll search out the perfect skillet, making sure it’s not marked on its handle with the dreaded “S,” a sign that it’s of second quality. But that skillet is American-made, will facilitate the creation of a multitude of meals and will probably do it better than any other brand on the market. But I know to stay away from that ebelskeiver pan they always put proudly on display. When the hell do I make ebelskeivers? And do I really need a corn stripper. I’m fine with my chef’s knife, thank you. See, I’m completely rational. 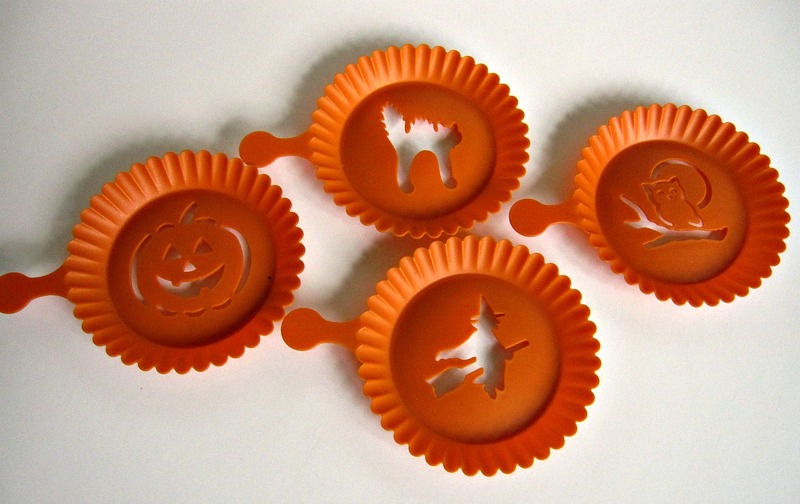 Except this one time when it was still 80 degrees out, but I decided I needed these cutesy Halloween stencils for cupcakes, which I like just fine, but rarely make. My feelings about the cupcake trend need a post of their own. So basically, I bought $10 plastic for a holiday that happens once a year for cupcakes that I probably wouldn’t make. That makes it a zero-trick pony? Sometimes in life, though, stupid impulsive decisions turn into opportunities. I had finally settled on an autumnal dessert for my father’s birthday that I planned on celebrating yesterday (until an unseasonable foot of snow and a power outage crashed the party). Layer cakes don’t intimidate me, but the cake from Baked Explorations I chose seemed to frustrate many in the blogosphere because of its Caramel Buttercream. It’s a boiled flour frosting, a style I’ve used from the authors Matt Lewis and Renato Proliafito before. I liken the finished product to an egg-less Swiss Merengue, because it is silky and buttery (3 sticks buttery) and not too sweet. I love how it spreads, swirls and pipes. But bloggers used words like “grainy”, “soupy”, and “FAIL”. Those are not words I like to hear, so I gave it a go in advance, and it came out beautifully. I didn’t want to store it until the party, and I certainly wasn’t going to chuck it. So to stop myself from downing it with a spoon, I wanted to whip up something quick, for which I had all the ingredients on hand. 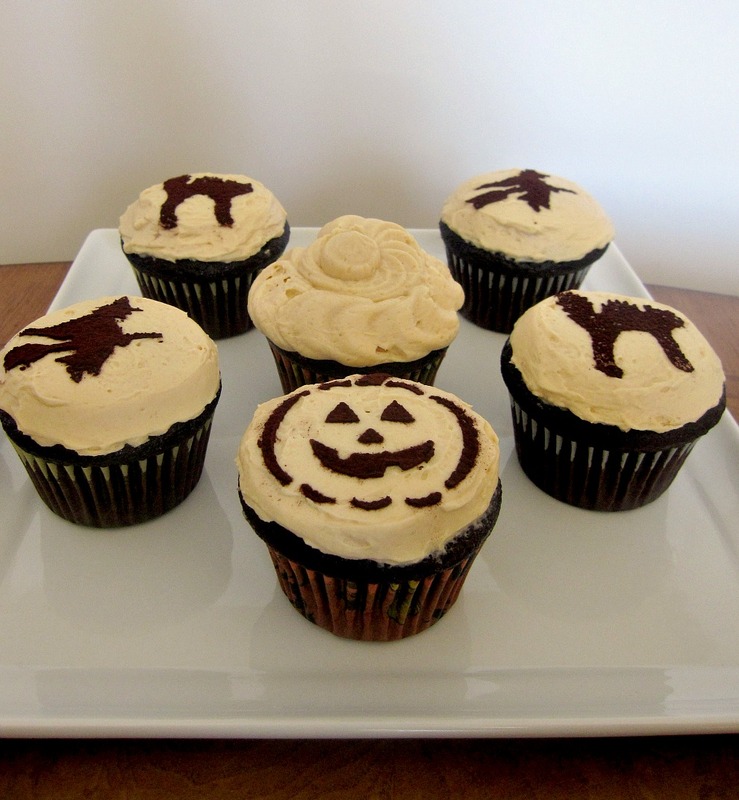 I decided to go with chocolate cupcakes for Halloween. Then I got crafty. And I have to say, these babies are pretty darn cute. After having nibbled away at plenty of pieces of chocolate cupcakes off the snack tray at Flour, I knew it would be the perfect Halloween cupcake: rich, deep, dark and moist. A half-hearted baking project turned into a very tasty treat. And the spooky chocolate-caramel combo just screams for a sprinkling of salt. 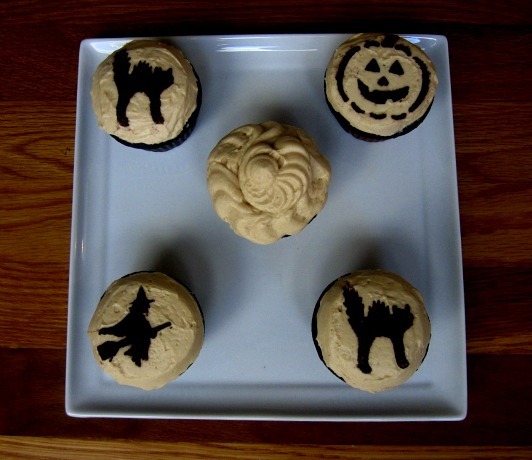 If you want to adorn future cupcakes with pointy-nosed witches, scaredy cats, owls and cutie pie pumpkins, I’m sure these stencils will be on the sale table at the Williams-Sonoma Outlet…for half the price. I will make that cake one day, so look out for the recipe for that sinful caramel buttercream. I got the recipe for the cupcakes from Joanne Chang’s Flour: Spectacular Recipes from Boston’s Flour Bakery + Cafe, but you can also find it here (Just don’t bake them for the written 30 minutes. Start checking at 20). Happy Halloween! I love this idea for decorations. Cute and simple! That frosting is amazing… and I had no problems with it either. 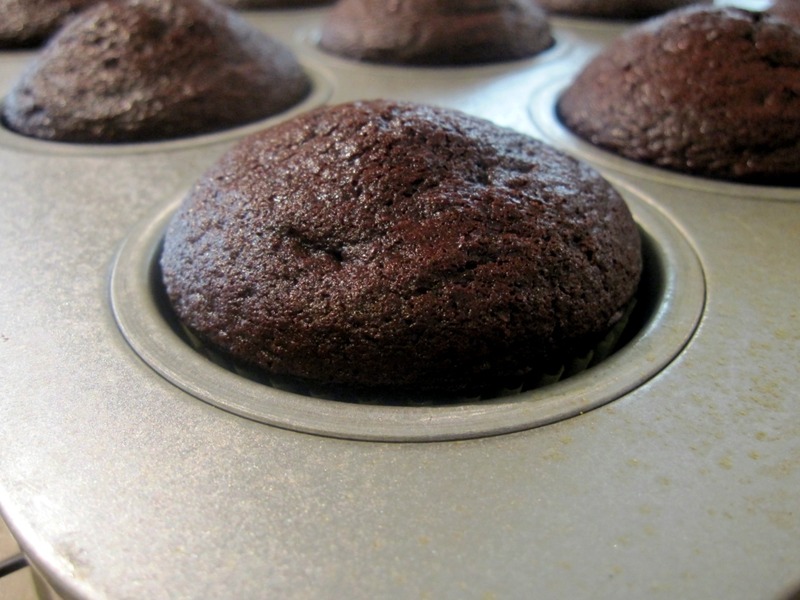 And the Flour chocolate cupcake recipe is my favorite… I posted them today too. :) Oh, and willpower at W-S. Absolutely none. I own an ebelskiver pan and cookbook. I’ve used it twice. These are adorable! I’ve tried to make a boiled flour frosting before and it definitely failed, so I’m glad to know it works… will have to try again soon! Hi Nicole. I’m sorry for the late response–I’ve had to take an unwanted break from this space. Luckily, it’s not yet Halloween! I didn’t have too much of a problem, but I anticipated the challenges of using it in advance. 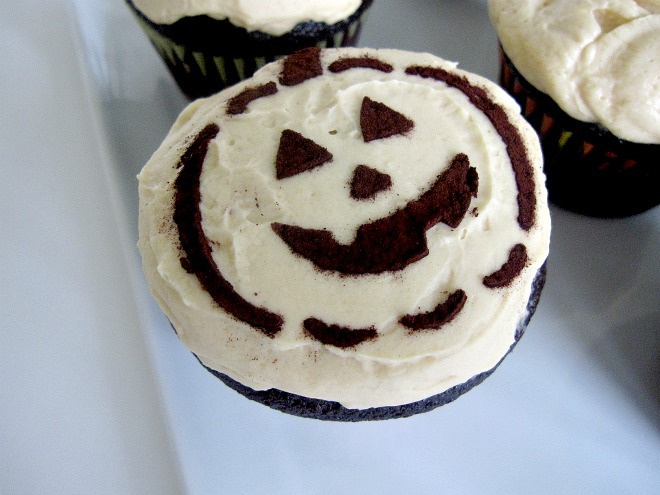 First, I made sure to eyeball my frosting of the cupcakes so that it mirrored the curvature of the stencil. Next, I used a very ethereal buttercream, similar in texture to that of a Swiss meringue buttercream. I very lightly placed the stencil atop the cupcakes (there were no gaps given that I frosted them according to the curve of the stencil), dusted on the topping, and then removed it straight up and quickly. Any time that it did slightly mar the surface, I gently smoothed out that area with the side of a toothpick. I didn’t try this since I didn’t have dificulty, but I wonder if you could lightly grease the bottom of the stencil to avoid any other probalems with sticking. I hope that helps. Let me know what happens!